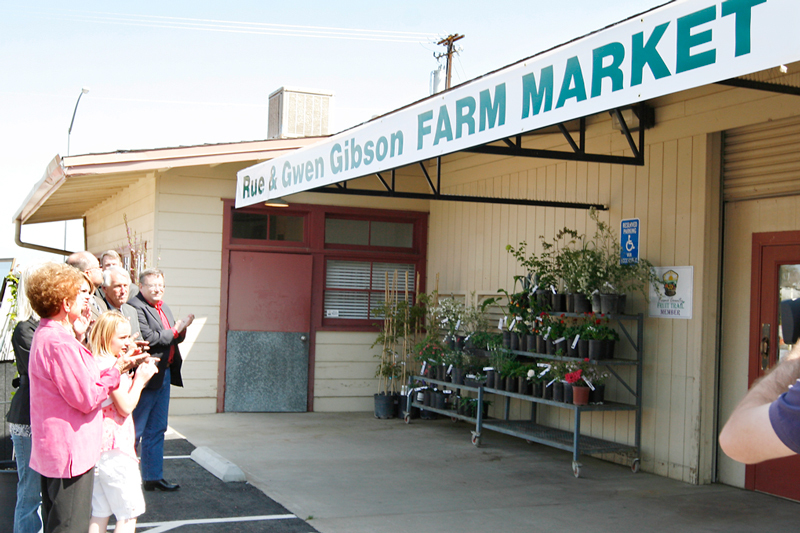 The newly named Rue and Gwen Gibson Farm Market was unveiled yesterday in honor of the parents of the late Joyce Mae Gibson, who gave $2 million to help expand the market, and establish an endowment for the Equine Studies program. 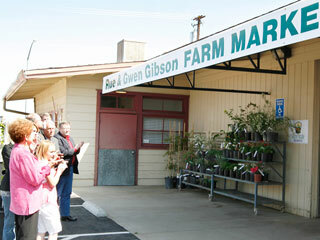 The gift provides $1.5 million to enhance the farm marketâ€™s features and provide an interactive experience for customers. The other $500,000 will establish the Rue and Gwen Gibson Endowment for Equine Studies that may be used to enhance the horse farm facilities and further develop its research program. This is one of the largest donations the farm market has received since its establishment in 1984 as a roadside fruit stand. Dean of Agricultural Sciences and Technology Dean Boyer, Ph.D., said the funds will provide great opportunities for students to expand on what they are doing in the classroom. â€œThe market helps to provide field-to-fork training for students that includes all aspects of food production,â€ Boyer said. The farm marketâ€™s new features will include an ice cream parlor, a deli shop, an outdoor dining area, a wine-tasting room, an observational bakery, a cooking demonstration facility, a flower shop and a plant nursery. Another addition will be an organic vegetable garden, adjacent to the market. Sophomore Jason Ferreira works in the farm market and said that he is looking forward to the ice cream parlor and the patio outside where students and customers can sit and eat their purchases. â€œThe best educational experience is getting to see how all the ag units come together to create the products for the store and keep it running,â€ Ferreira said. Last year, the farm marketâ€™s sales totaled more than $1 million, with the profits going back into the individual units that produced the products that were sold. Director of the farm market Ganesan Srinivasan said the enhancements to the store will further help students showcase their products while creating a learning experience for customers, with audio-visual exhibits to show them how their food is produced. â€œWhat makes the market unique is not what is sold, but that it is grown right here,â€ Srinivasan said. A committee has been established to decide exactly how the money will be spent and whether the existing farm market structure will be renovated or a new building will be constructed. 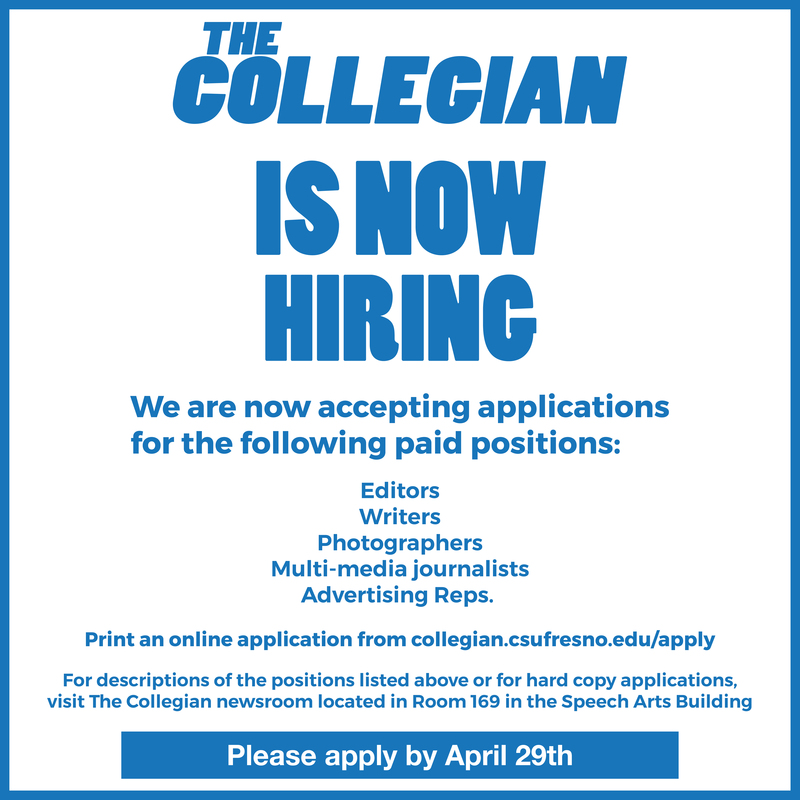 Construction of the new projects is scheduled to begin as early as this fall, Srinivasan said. The other program benefiting from Joyce Mae Gibsonâ€™s generosity is Equine Studies. 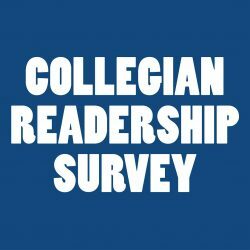 â€œWe are going to be able to improve facilities and enhance projects in and outside of the classroom,â€ said equine science major, Jennifer Schlitz. Equine studies instructor Anne Rodiek, Ph.D. runs the horse unit on campus and said this gift is wonderful because the program is challenging to maintain due to the high costs associated with it. Rodiek had the opportunity to meet Joyce Mae Gibson a few times around the student farm, before she died in January. 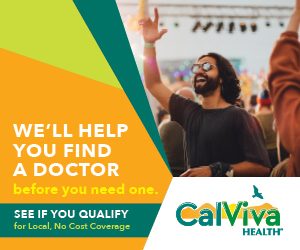 â€œJoyce Gibson was a charming person and she had a great understanding of how important our program is for our students and the Central Valley,â€ Rodiek said. Joyce Mae Gibsonâ€™s sister, Beverly Knobloch, spoke at the celebration and remembered her sisterâ€™s and parentsâ€™ devotion to the Valley and its agricultural history. â€œShe really wanted to give back to the community and say thank you. 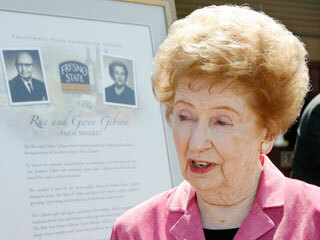 She loved Fresno,â€ Knobloch said. Joyce Mae Gibson began her career as a teacher in the Fresno Unified School District but later changed her focus and became the second female attorney in the Fresno County District Attorneyâ€™s Office. She worked alongside her father Rue Gibson and the pair was among the first father-daughter legal teams to practice in Fresno. 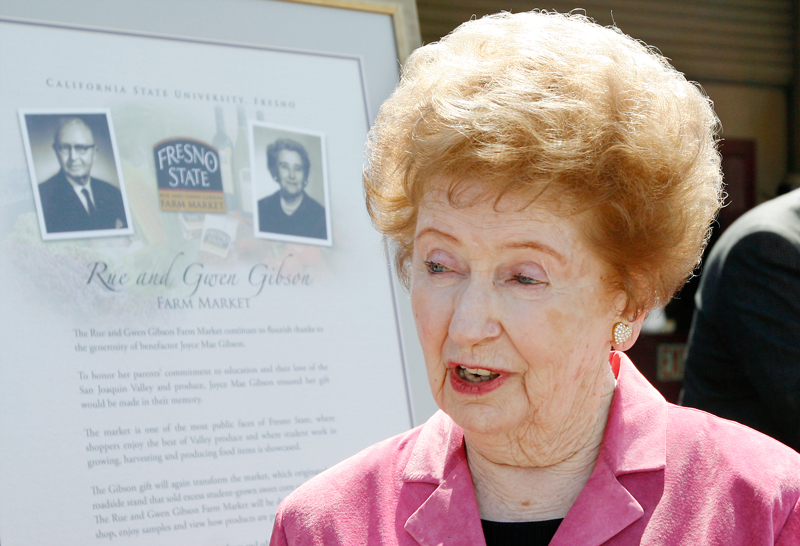 Joyce Mae Gibsonâ€™s mother Gwen Gibson received her teaching credential from Fresno State and taught for 20 years in Fresno County. Knobloch said that her parentâ€™s, Rue and Gwen Gibson grew vegetables along the San Joaquin River and her father would ride horseback alongside them every day until he was 95.
â€œMy parents would really be overwhelmed by the farm market and my father adored horses a lot,â€ Knobloch said.